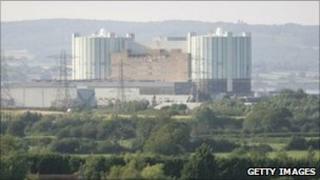 One of the two nuclear reactors at Oldbury Power Station in South Gloucestershire is to be shut down permanently at midnight. Reactor 2, which has been operating for 43 years, will generate electricity for the last time on Thursday. It was originally earmarked to close in December 2008, but its operating life was extended. It first started generating electricity in April 1968 and has featured in television shows including Doctor Who. An Oldbury Power Station spokeswoman said the plant's operator Magnox decided to shut it because it has reached the end of its operational life, and because of limited fuel stocks. The uranium fuel used at Oldbury, which is owned by the Nuclear Decommissioning Authority, stopped being manufactured in 2008, she said. She added that in its lifetime, Reactor 2 has produced more than 65 terawatt hours of electricity, equivalent to powering a million homes for more than 10 years. The reactor has also featured in television shows including an episode of Doctor Who in the 1970s and Blake 7, and the rock group Slade recorded in it for Top Of The Pops. Oldbury site director Phil Sprague said it was a "historic" day for Oldbury and past and present staff. "Reactor 2 has operated safely and provided the UK with a vital source of power for over four decades, something that everyone who has worked at the site should be very proud of," he said. "It is a testament to the skill and dedication of the workforce who have operated and maintained the reactor to such a high standard that it has been able to generate safely for such a long period of time. "I would like to extend my thanks to all those who have been involved with operations at Oldbury during this time." Reactor 1, which started generating electricity in 1967, will continue to operate until the end of 2012.